The very smallest dog breed, the Chihuahua is ever vigilant and fleet of foot, with a spunky attitude. Compact with a terrier-like temperament, the Chihuahua has the appearance of a fine-boned but muscular dog that carries his sickle-shaped tail like a flag. Their distinctive apple dome head features large eyes, dark or a luminous ruby in color, and large ears that stand erect when the dog is alert and flare out to the sides when at rest. The muzzle is short and pointed with a self-colored nose. Chihuahuas have two coat types, smooth and long. The smooth coat should be soft and close, with a perceptible sheen. Long coats can be flat or wavy, with an undercoat, fringed ears, feathering on the feet and legs, and a tail that looks much like a plume. 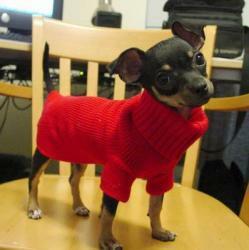 A Chihuahua’s coat can be of any color or patterning. Many Americans recognize the Chihuahua as the Taco Bell Dog from the popular “Yo quiero Taco Bell” advertising campaign. Alert with terrier-like qualities, the Chihuahua can be irritable, overconfident or downright nasty when provoked. Nevertheless, this spunky little Toy’s intense devotion to its “person” has earned the affection of millions of owners.The Chihuahua is brave and is known to defend itself and its home from large dogs and invaders by barking in protest and threatening mayhem. Chihuahuas are not recommended for homes with small children but do well with elderly individuals or couples, or an owner who loves to spoil. The Chihuahua is typically wary of strangers and unknown dogs (except other Chihuahuas), but gets along well with other pets in the house. Chihuahuas are a long-lived breed with minimal grooming needs. The smooth coat type should be brushed or wiped with a cloth occasionally; the long coat should be brushed daily. A monthly bath is recommended, but take care to keep the ears dry. This breed is an average shedder.